If you dream of leaving the modern world behind and immersing yourself in the great outdoors, then a stay at The Willows could be just the ticket. 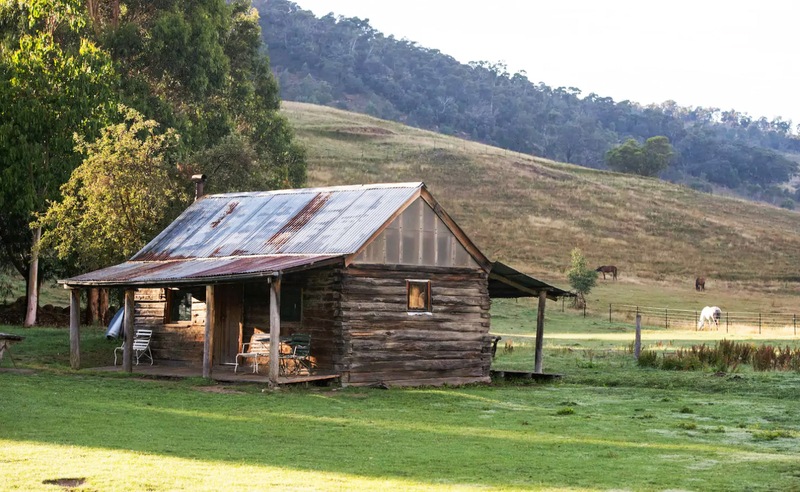 Located near Anglers Rest in the remote and ruggedly beautiful Bundarra Valley, The Willows is an authentic working horse property offering homely accommodation and warm hospitality. An hour from Falls Creek and a stone’s throw from the Bundarra, Mitta Mitta, and Cobungra Rivers, it’s an ideal base to explore the region’s fantastic cycling, mountain biking, bushwalking, seasonal white water rafting, fly fishing, and horse riding opportunities. And when you come home, you can enjoy a hot shower, tasty meal, and campfire under a blanket of a million stars in one of The Willow’s High Country huts. There are two huts. O'Connells Hut is a cattlemen's log hut that was built in 1904 and the Iron Hut is a corrugated iron hut that was originally built as a 'men's shed' workshop in the 1940s. 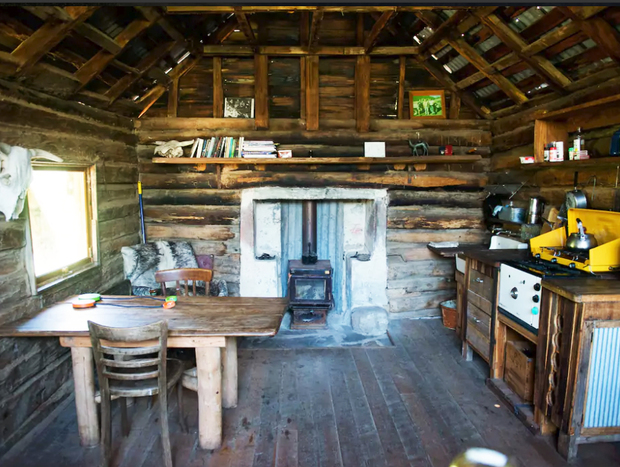 Both huts offer comfortable, rustic, self-contained accommodation for people who love outdoor life, wood burners, gas lights, camp fires and an outdoor dunny. The huts have one open plan kitchen/living area with a double and single bed, and a bathroom off to the side of the main room. Towels and linen are provided, and dogs that are kept under control or on a lead are welcome. Due to our remote location, there is no main power. The property relies on solar and a small hydro system so appliances such as hairdryers won't work. There is no television and mobile reception is pretty patchy. However, you'll be only too happy to turn off your phone and tune into the beauty of your surrounds. But if you are after a little company, then we recommend you drop in to the Blue Duck for a beer, bite to eat and a yarn with the locals. Perched on the banks of the Cobungra River and just 3km down the road from us, it's a lovely little watering hole to while away a few hours. Historic Huts - Each hut accommodates 2 people for $150 /night. An additional 2 people can stay for $150/night in the second hut. You'll find us at The Willows, 322 Callaghans Road, Anglers Rest, Victoria. This adventurous day ride gives you access to a beautiful section of the Victorian High Country that’s remote and off the main tourist track. Tour operator and experienced horsewoman Helen Packer has been running trail rides in this region for nearly 30 years. And her extensive local knowledge means that she can offer a range of exciting horse riding experiences. Whether you want to venture deep into the bush to explore eucalypt forests and crystal clear rivers or enjoy views of the stunning surrounds and spot local wildlife, Helen can organise a day ride that will inspire you. The Bundara River flows at the bottom of the property. The trout fishing is as legendary as the High Country and the Cattlemen that rode them. The Willows provides the ideal base to access and fish the Bundara, Cobungra, Mitta, Gibbo and Victoria Rivers as well as Snowy Creek system. 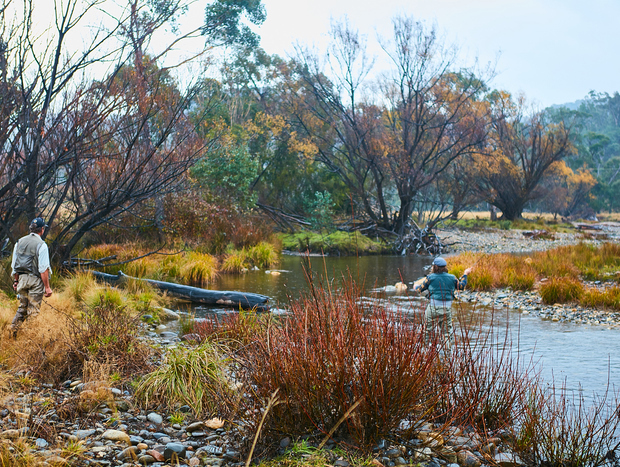 Fly Fishermen have long recognised The Willows and the region as providing the pinnacle of Fly Fishing opportunities in Victoria. If you love bushwalking and cycling, then our position on the edge of the Alpine National Park makes us a great base from which to explore the region on foot or two wheels. Just 45 minutes up the road is Mount Wills. A moderately challenging 3km hike, we think this walk has one of the best reward for effort ratios in the region because the views at the top are truly breathtaking. Enjoy panoramic views of the High Country that includes a view to Mount Kosciusko in New South Wales on a clear day. The trail head starts at the Tallangata Ski Club. Explore the rich alpine history alive in the hills and aqueducts surrounding Falls Creek. The walking and hiking trails expose you to the beauty and majesty of the Bogong High Plains.